Directed by Rita Sarin and Tenzing Sonam. In English, Tibetan and Mandarin with subtitles. This vital, illuminating and provocative documentary focuses on the struggle of Tibetans to achieve independence as a nation during the largest uprising ever since China had taken control over Tibet back in 1959. Exiled Tibetans living in India decided to march all the way to the border of Tibet to protest in March 2008 despite that China sent soldiers and policemen to stop them by force from moving onward. The 14th Dalai Lama, whose real name is Tenzin Gyatso, believes in a policy called the Middle Way Approach which represents a compromise with the Chinese because it gives up Tibet’s independence in exchange for genuine autonomy for Tibetans. Through that policy, he hopes to achieve stability within Tibet, but, unfortunately, China has not accepted it yet. Worst-of-all, the Chinese government refuses to even speak to Tibetan officials to discuss their concerns. Tibetans, interestingly, differ in opinions when it comes to how they feel about the policy because some of them, especially, the younger generations, refuse to compromise and, instead, will do everything in their ability to protest even if it means that they’re risking their lives. Co-directors Rita Sarin and Tenzing Sonam wisely show the multifaceted issue of Tibetan’s struggle for independence by not only including fascinating interviews with His Holiness himself, but also including interviews with ex- political prisoner Rigzin Choekyi, poet/activist Lhasang Tsering, historian Tsering Shakya and others who provide their own intelligent perspectives and analysis regarding the complex sociopolitical issue. In many ways, it’s also a human rights issue that needs to be fully grasped, openly debated and, hopefully, solved because, otherwise, Tibetans run the risk of following the same doomed path of the American Indians. Young generations should watch this film with an open mind and an open heart while remembering that, even though history does tend to repeat itself, there’s always at least a glimmer of hope as long as awareness of Tibet’s struggles for independence increases and that people, not just in Tibet, but all over the world, find a way to overcome their apathy, selfishness, ego and simple-mindedness. 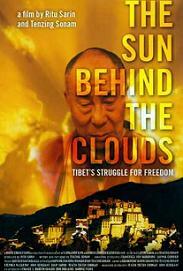 At a running time of 1 hour and 19 minutes The Sun Behind the Clouds manages to be an eye-opening, provocative, vital and well-balanced examination of Tibet’s multifaceted, ongoing struggle for independence. Number of times I checked my watch: 1 Released by Balcony Releasing. Opens at the Film Forum.